The Swiss striker Janica Sprunger and her buddies at the Dubai World Cup were awarded two 160-meter-high barriers, the best prize at the Dubai International High Jump Championships, Dubai Equestrian Center, in the Emirates Equestrian Center in Dubai, in cooperation with the Federation of equestrian and racing and supervision of the International Equestrian Federation, and the six competitions were held for four days and participated in the first round of Grand Prix 31 knights and knights, among which 9 knights managed to go to the second round To go, Including 4 knights with a performance score of n Gianica took the lead of the Italian pianist Paolo Payne and Persia, who won the second place, while the third place winner Philippe Weishauth was awarded the "Phantastic" horse. The British team mate Georgia Tim defeated the Persians, the Zvn Kartina, over the Longin team to collect the points with the Joker, sponsored by Longin. The course was designed with 10 obstacles of 145 cm, with the exception of the Joker, which usually higher. 7 of them were knights in the pool of points (65 points), and the young knight Abdel Rahman Ahmed Amin scored the horse "Newton Abbott" and the international championship of the two star category under the auspices of Maidan, while the leadership of the Charlotte Mccouli with her horse "Valentino Tolimir", On the horse «Domenica» Best trophy cup Real estate, tour specifications rounds, and designed their course reached a height of 155 barriers cm, and replaced by a second Swedish Jockey Linda Head of Paljoad «Jarvis» , and the third prize went to the British William Finul Knight Paljoad «Billy Dyadmo». 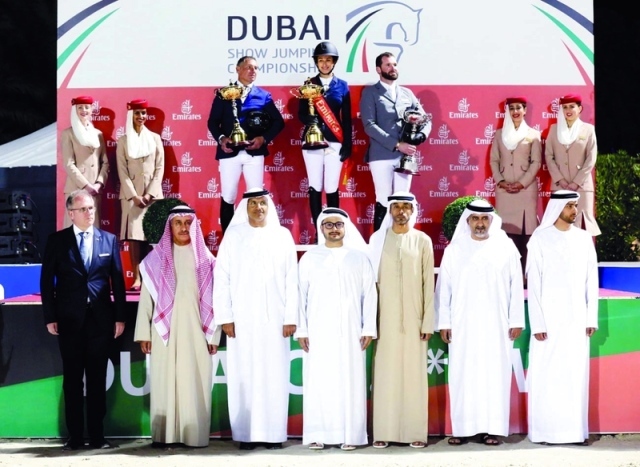 Mohammed Issa Al Adib, director of Dubai Equestrian Club, chairman of the organizing committee, said: "Today we are presenting a new version of the five-star Dubai International Jumping Championship with more participation from the countries and cavalry that the tournament has attracted. 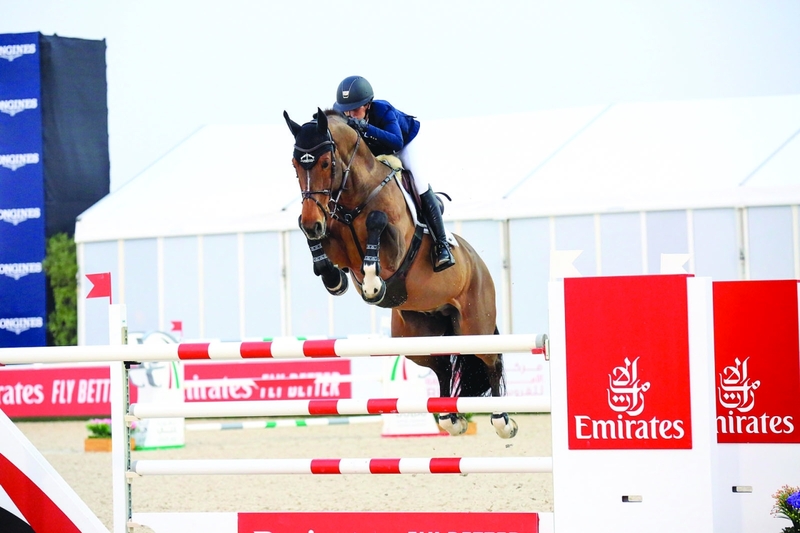 it gave the sponsors and participants the opportunity to close the event in a way worthy of the Dubai International Jumping Championships, coinciding with a two-star international championship to allow more cavalry, especially for the jumping riders of the UAE who did not participate in the The five-star president is a mentor who will develop the knights' skills in the future and push them to higher positions, while continuing to work on development and improving show jumping in general and the next edition of the tournament. special. Hamad Al Shamsi expressed his thanks to his Highness Sheikh Mohammed bin Rashid Al Maktoum, vice president and prime minister of the UAE and Ruler of Dubai, and his highness Sheikh Hamdan bin Mohammed bin Rashid Al Maktoum, crown prince of Dubai for the support of all equestrian activities and their development. , And Saeed bin Humaid Al Tayer for the support of Meedan for the Equestrian Center of the Emirates, and to make it possible to work in the spirit of a team in all aspects of administrative and technical respect, which is one of the main reasons is the success of the championship has ensured, and we get a good picture of the equipment delivered, The stables that greeted the Khayo During the days of the tournament, Al Shamsi thanked all committees that were working in the tournament, and the media and television, which in turn performed the event in all its reading and viewing days. In the final match a number of equestrian club representatives, sponsors and Gamur Ghafir corresponded positively with the presentations of the elite cavalry participants from 30 countries around the world, and the best results of the G7 Knights who are interested to get more points to participate in the World Cup to jump, That took place at the Dubai International Championship.At the end of the award ceremony, the chairman of the organizing committee gave memorial shields to the players who played a positive role during the days of the events that contributed to the success of the tournament.